This appendix describes the statistical methods used to measure educational attainment by religion, including average years of schooling. It then provides an overview of the data sources used in the report. (A full list of data sources used for each country can be found in Appendix B.) The appendix continues with a discussion of how religious schools were classified in this report, and a description of some challenges associated with measuring change in educational attainment across generations. Estimation and weighting procedures also are discussed. Finally, a list of countries included in each region is included at the end of this appendix. This study focuses on shares of population with no formal schooling and post-secondary education as measures of educational attainment. A third measure used is average years of schooling, which has the advantage of expressing the level of educational attainment in the population in a single number. For this reason, it is a widely used measure in cross-country comparisons of educational attainment. 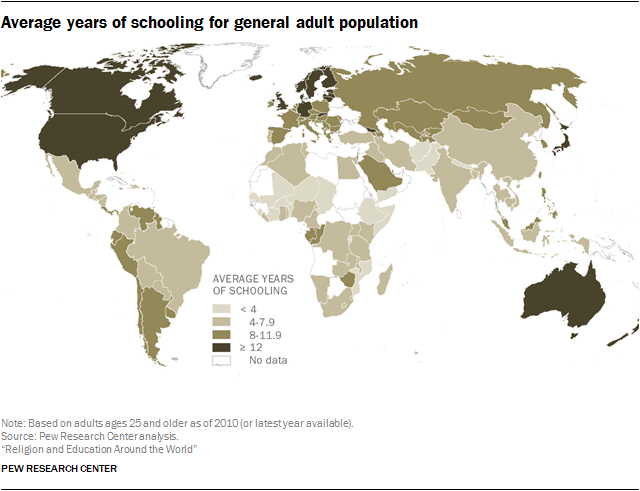 Average years of schooling (or mean years of schooling, MYS) is calculated as the weighted average of the number of years of school completed by adults who are at least 25 years old. To compute MYS, one has to know how many years a person spent in school when graduating from a given level. The computation is complicated by two issues: First, educational systems change over time, so the standard durations of schooling change across cohorts depending on when they studied and graduated; second, students with the same level who graduated from different schools (for example, vocational schools or apprenticeship trainings) needed different number of grades to graduate. To account for these factors, this report relied on prior work by researchers at the Wittgenstein Centre for Demography and Global Human Capital (WIC). 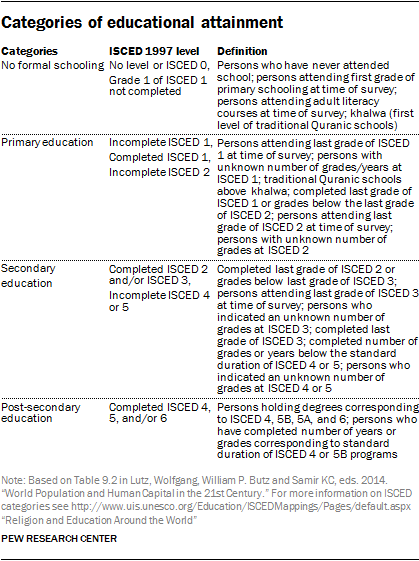 In their work estimating current and future levels of educational attainment around the world, WIC researchers developed a series of procedures to account for country-specific educational systems as well as changes in these systems over time.7273 Following this example, we use standard duration of schooling corresponding to the ISCED 1997 A levels in country-specific mappings, and apply cohort-specific duration to account for changes of education systems over time. MYS can be computed from the data organized into educational levels, or from detailed information of level, type of school completed and number of years or grades completed at a given level. When individual-level data on both level and grades were available, they were used to calculate average years of schooling for each religious group and for each of the three age cohorts examined in this study. This option was available in 53 countries. When individual-level data on years of schooling were unavailable, we used data organized into educational levels to estimate MYS. We used data organized into six education categories74 (instead of the four presented in the report) to estimate MYS by procedures developed at WIC. We applied standard durations of schooling corresponding to ISCED 1997 A levels, and simple models to compute average years of primary schooling for those with incomplete primary schooling.75 The standard durations as well as average years of schooling at a given level were identical across religious groups. We assume that average duration of post-secondary studies was four years, which accounts for the shorter duration of associate and technical degree programs (typically two years) as well as the much longer duration of master’s and Ph.D. programs. Data on educational attainment in 151 countries were collected from a variety of sources.76 For 74 countries, censuses that measured both religion and education were used as the main data source. In most cases, the censuses were conducted around 2010. If no census was carried out during this period, a census from an earlier period, around the year 2000, was used. For many pre-2010 census countries, estimates of the educational attainment of the youngest generation (born 1976-1985) could not be calculated because most cohort members had not reached age 25 (for more detail on generational analysis, see below). Countries with census data typically have estimates of educational attainment for a wider range of religious groups than surveys, which have smaller sample sizes. However, in most of the remaining countries, including China, the United States and France, religion is not measured in the census, so additional sources must be used. For 57 countries, the best recent nationally representative survey was used as the primary data source. Only surveys from well-established and reliable sources were used, for example the Demographic and Health Survey (DHS), Multiple Indicator Cluster Survey (MICS), Latinobarometer, European Social Survey (ESS), International Social Survey Program (ISSP) and surveys done by a national statistics office or well-known university. For a full list of data sources used for each country, see Data Sources by Country. In some cases, data from different years of the same survey (e.g., Latinobarómetro 2000-2010) were merged in order to have large enough sample sizes to make reliable estimates of educational attainment by religion and birth cohort. In most instances, survey data yielded estimates of education by religion for major religious groups in a country. When religious groups were too small to make reliable estimates, different data sources were used or combined to generate estimates or an indirect method of estimation was applied. Finally, among these 20 countries, the data for Muslims in Bahrain, Kuwait, Saudi Arabia and Qatar reflect only educational attainment for citizens of these Gulf countries. Educational attainment of citizens is used as a proxy for Muslim attainment because citizens overwhelmingly identify as Muslim. Although these countries also have large non-citizen populations, including Muslims and non-Muslims, breakdowns of educational attainment by religion of the non-citizen populations are not available. Religious schools that do not offer a secular curriculum, however, are, in principle, not counted as “formal schooling” in this study.79 They include Christian Sunday schools and Quranic schools that focus only on Islamic religious education. In sub-Saharan Africa, some Quranic schools focus on training students to recite the Quran in Arabic, which often is not their native language. Students of these schools often do not acquire basic literacy and numeracy skills. People whose only education is in the first level of traditional Quranic schools (khalwa) are included in the “no formal education” category. Estimates of the size and share of religious groups in every country as of 2010 come from Pew Research Center’s 2015 report, “The Future of World Religions: Population Growth Projections, 2010-2050.” That report has extensive detail and documentation on how religious groups were classified and counted. This report relies on the same methodology to measure religious affiliation. That is, respondents in every census or survey used were asked to self-identify with a religion. This measure of affiliation is sociological rather than theological. That is, it includes people who hold beliefs that may be viewed as unorthodox or heretical by others who claim the same religion. It also includes people who do not regularly practice the behaviors prescribed by their religion, such as those who seldom pray or attend worship services. Respondents were grouped into six major religious categories: Christians, Muslims, Hindus, Buddhists, Jews and the religiously unaffiliated, a category that includes those who identify as atheist, agnostic, or having no religion in particular. This study did not includes respondents who identified as members of folk religions (such as African traditional religions, Chinese folk religions, and Native American and Australian aboriginal religions) and other small religious groups (such as Sikhism, Taoism, Jainism, Shintoism, and the Baha’i faith) due to small sample size and inconsistent measurement across countries. This report presents estimates of educational attainment for the overall adult population ages 25 and older, as well as for three different generations of the adult population. The oldest generation includes adults born between 1936 and 1955 (ages 55 to 74 in 2010); the middle generation born between 1956 and 1975 (ages 35 to 54 in 2010), and the youngest generation born between 1976 and 1985 (ages 25 to 34 in 2010). The rationale for estimating educational attainment among adults at least 25 years old is that at this age, most adults are likely to have reached their highest level of educational attainment. In some countries, measuring educational attainment among younger adults ages 18 to 24, for instance, could be potentially misleading because many in this age cohort are still in school. The 151 countries in this study include 95% of the global population of adults 25 and older, as of 2010. 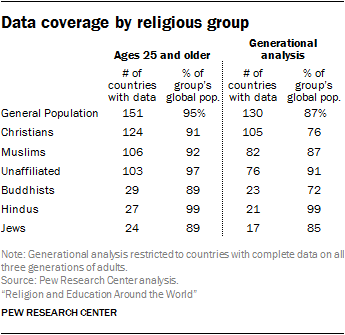 For religious groups, the countries with available data represent at least 89% (for Buddhists and Jews) and as much as 99% (for Hindus) of their global population. This study has generational data for 130 countries, representing 87% of the world’s population age 25-74 in 2010. For religious groups, the countries with available generational data represent at least 72% (for Buddhists) and as much as 99% (for Hindus) of their global population. Comparing older and younger generations of adults provides an important look at how a religious group’s educational attainment has changed in recent decades. However, this generational analysis of educational change should be interpreted with some caution. Many countries have immigration policies that privilege younger, highly educated immigrants. As a result, the youngest generations in this study may include a larger share of new immigrants. Migration of highly skilled immigrants could also result in lower estimates of attainment among those left behind in sending countries (i.e., “brain drain”). In addition, educational attainment affects mortality in that more highly educated adults typically live longer than less-educated adults in many countries. This could make the oldest generation in this report (ages 55 to 74 in 2010), appear more highly educated than if their attainment was measured thirty years ago when they were younger and the less-educated members of the cohort were still alive. (Members of the study’s oldest generation were between the ages of 25 and 44 in 1980.) For this reason, estimates of the educational changes described across generations are likely to be conservative estimates. In countries for which the main source of data was a survey, the number of survey respondents was often too small to calculate reliable estimates of educational attainment among minority religious groups for each generation. In addition, estimates for some countries are based on census data collected prior to 2010, which meant that some members of the youngest generation (born 1976 to 1985) were younger than age 25 at the time of data collection. Because substantial shares of adults younger than 25 were still enrolled in school in many countries, only data on generational members who were at least 25 years old were used to create estimates for the youngest generation in countries with pre-2010 data. For example, in Iran, where the main source of data was the 2006 census, the youngest generation in this study only includes adults born between 1976 and 1981 (ages 25 to 30 in 2006). For a few additional countries with data collected prior to 2003, educational estimates of the youngest cohort were not calculated because too few respondents were ages 25 and older. The analysis of generational change at the global, regional, and country levels relied on data only from those countries for which complete data on all three generations was available – 130 countries in total. Estimates of educational attainment are reported only for groups with a sufficient number of respondents. When census data were available for fewer than 250 respondents in a group, those values are included in regional and global averages but not reported at the country level. For example, census data were available for 241 Jews in Aruba. While these values are not reported in the data table or online sortable tables because they are below this threshold, they are included in the Jewish population-weighted measure of average Jewish attainment for the Latin America and Caribbean region as well as global Jewish values. For census data, cohort analysis is reported only for group in which the sample size consisted of at least 750 respondents, including respondents in the youngest cohort. Countries without data for the youngest cohort are excluded from all cohort analyses. For countries whose main data source was a survey, an additional procedure was employed to create population estimates of educational attainment by religion. Highly educated people are often overrepresented on surveys because they are more willing to answer a survey. In addition, because surveys include margins of error, estimates of the educational or religious composition of the population from a given survey can differ substantially from more accurate estimates derived from a census. But in many countries, the United States, for example, the census asks about educational attainment but not religious affiliation. In these cases, estimates of education by religion derived from surveys were adjusted so that the educational attainment for the total population (all religions combined) matched the best available estimate (typically a census), and the country’s religious composition (all education categories combined) matched Pew Research Center’s 2010 population estimates. Global and regional estimates of educational attainment by religion were calculated by weighting each country’s data by the size of the respective population. In nearly all cases, the size of religious groups (by gender and generation) came from Pew Research Center’s 2015 report, “The Future of World Religions: Population Growth Projections, 2010-2050.” Different population weights were used in a handful of countries. In Czech Republic, large shares of the population did not declare their religious affiliation and/or educational attainment on the census. For this reason, estimates in both countries were weighted according to the number of people who provided both their religious affiliation and educational attainment. In Bahrain, Kuwait, Saudi Arabia and Qatar, educational attainment estimates for Muslims are weighted by the size of the citizen population because it was not possible to estimate educational difference by religion among the non-citizen populations of these countries. This report groups 151 countries and territories with available education and religion data into six major regions: Asia and the Pacific, Europe, Latin America and the Caribbean, the Middle East and North Africa, North America, and sub-Saharan Africa. The 35 countries and territories in the Asia and the Pacific region are: Afghanistan, Armenia, Australia, Azerbaijan, Bangladesh, Cambodia, China, Federated States of Micronesia, Fiji, Hong Kong, India, Indonesia, Iran, Japan, Kazakhstan, Kyrgyzstan, Malaysia, Maldives, Mongolia, Nepal, New Zealand, Pakistan, Philippines, Samoa, Singapore, South Korea, Taiwan, Tajikistan, Thailand, Timor-Leste, Tonga, Turkey, Uzbekistan, Vanuatu and Vietnam. The 36 countries and territories in Europe are: Albania, Austria, Belgium, Bulgaria, Croatia, Czech Republic, Denmark, Estonia, Finland, France, Georgia, Germany, Greece, Hungary, Iceland, Ireland, Italy, Kosovo, Latvia, Lithuania, Malta, Moldova, Montenegro, Netherlands, Norway, Poland, Portugal, Romania, Russia, Serbia, Slovakia, Slovenia, Spain, Sweden, Switzerland and United Kingdom. The 30 countries and territories in Latin America and the Caribbean are: Argentina, Aruba, Bahamas, Belize, Bolivia, Brazil, Chile, Colombia, Costa Rica, Dominican Republic, Ecuador, El Salvador, Guadeloupe, Guatemala, Guyana, Haiti, Honduras, Jamaica, Martinique, Mexico, Nicaragua, Panama, Paraguay, Peru, Puerto Rico, St. Lucia, St. Vincent and the Grenadines, Trinidad and Tobago, Uruguay and Venezuela. The 12 countries and territories in the Middle East and North Africa are: Algeria, Bahrain, Egypt, Iraq, Israel, Kuwait, Morocco, Palestinian territories, Qatar, Saudi Arabia, Tunisia and Yemen. The 2 countries and territories in North America are: United States and Canada. The 36 countries and territories in sub-Saharan Africa include Benin, Burkina Faso, Burundi, Cameroon, Cape Verde, Chad, Comoros, Democratic Republic of the Congo, Ethiopia, Gabon, Gambia, Ghana, Ivory Coast, Kenya, Lesotho, Liberia, Madagascar, Malawi, Mali, Mauritius, Mozambique, Namibia, Niger, Nigeria, Republic of the Congo, Rwanda, Senegal, Sierra Leone, Somalia, South Africa, Swaziland, Tanzania, Togo, Uganda, Zambia and Zimbabwe.